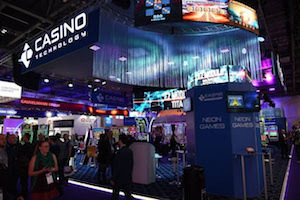 Casino Technology's newest product offerings made an impressive inroad on the gaming stage at ICE London, coinciding with the company's 20th anniversary. Products including EZ Modulo Titan, EZ Modulo Tower were on display, as well as the new line of Progressive Jackpot concepts, presented by the Gorilla Wheel multi-game suite, and the latest Clover Charm game pack. Rossi McKee, vice president of Casino Technology, said: ”At ICE we stated our intentions for what will be an incredible year for Casino Technology. As we celebrate our 20th Anniversary as a successful global gaming manufacturer, stepping on a solid foundation, we are moving forward, looking for the new and broadened business horizons ahead of us."